Jar canning is a great way of preserving foods from your own garden or from nearby farmer’s market. A lot of people think that canning food is difficult; however, it is a simple process when you know the basics. 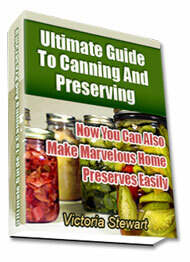 Safety is one essential aspect of canning foods. Should you happen to wander in your home’s basement and come across old containers or jars full of foods you have forgotten, be sure to put it away as it is absolutely dangerous. Always check canned goods before consuming ñ the jar, the expiration date and the seal. Some people might think canned goods are safe to use even for years.†There is no truth in that as expiration date varies depending on the preserved food. On the other hand, you can keep the container for your jar canning endeavor. Just remember to sterilize them before using. Nowadays, there are safe and recommended techniques for home canning – boiling-water bath and pressure canning. Water bath technique is mostly used in processing high acid foods while pressure canning is generally used in processing low acid foods. When jar canning, you cannot reuse the metal lids. Yes, you can reuse the bands and rings, at least they do not form the seal.†Bands are basically used in holding the lid properly until it pops and seals through the cooling procedure.†Then, the band no longer functions, thus it may be removed.†Metal lids are always available and affordable so you can buy them anytime rather than recycling used seals. The popping sound takes place through the cooling process. It is a sign that your jars are accurately done and sealed.†When jar canning within a high pressure canner, food contents are heated and makes air come out forcibly from the jar.†When the containers cool down, the metal fastener or seal is plainly sucked down, making the jar sealed. It only means that nothing could enter in and out, unless the jar is opened. Place your canned goods in a cool dry place as high as well as freezing temperature could damage container seals.†Always check the jars before use and refrain from using jars with chips and cracks. Never cut corners on suggested processing periods or definite pressures for home jar canning.†Do not assume that the food is safe just because the jar pops and seals.†The jar contents must be heated at the right temperature, for a specific period of time through a recommended technique.†It is essential that food heats and is left heated for that specified time to thoroughly kill bacteria and microorganisms. Make use of a high quality canner which seals as it should be. Follow instructions and never skip steps in jar canning. Clean looking jars do not mean that they are sterilized containers.†Do not miss sterilization process of your jars based on the instructions indicated.†Through skipping steps and not being able to follow directions, you are causing possible harm.